We're pleased to announce a new biweekly column from the author of the blog Choosing Raw: Gena Hamshaw eats a mostly raw, vegan diet without losing time, money, or her sanity. Let her show you how to make "rabbit food" taste delicious and satisfying every other Thursday on Food52. 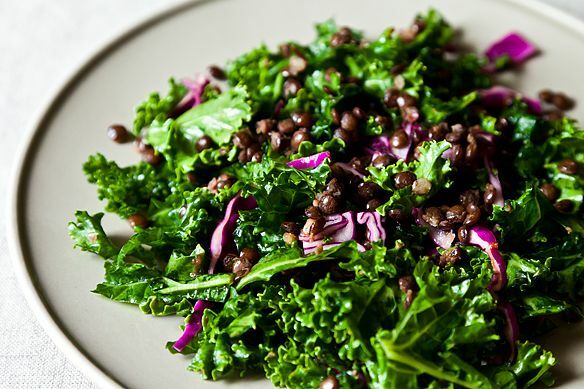 Today: It's easy being green -- especially with Gena's raw kale and lentil salad. When I became vegan six years ago, my decision was received with a mixture of enthusiasm and skepticism. "Good for you," some of my friends and colleagues said. Others exclaimed things like "well, you look healthy!" In the years that have followed, veganism has stepped into the national spotlight, and I encounter fewer expressions of well-intentioned concern. Yet for all of its sudden popularity, vegan cooking remains daunting to many home chefs. To make a beautiful pasta dish or stir fry every now and then is all well and good, but how does one incorporate vegan food into a steady rotation of go-to meals? What does a balanced vegan plate consist of? Must you learn to cook tofu? My hope is that I can show you that vegan recipes -- cooked, raw, sweet and savory -- need not feel overly exotic. You do not need to fill your pantry with a new battery of condiments, and no, you don't have to love tofu (though I bet I can tempt you to try it). Whether you're looking to add a meatless meal to your weeknight rotation or just figure out what to serve to vegan friends at a dinner party, vegan cooking requires nothing more than a willingness to see new possibility in the same vegetables, grains, and legumes you've been familiar with all along. I became vegan in my early twenties, when a physician recommended I try cutting dairy out of my already vegetarian diet as a means of managing some digestive ailments. Veganism did help me to feel better, but moreover, it gave me an opportunity to expand my palate, to explore new textures and flavors, and to become innovative with the vegetables I'd always taken for granted. Before I became vegan, I was under the impression that all vegans ate like my vegetarian hallmates in college: thrice daily Tofurkey sandwiches, breakfasts of "fakin" (a faux bacon product that, years later, still turns my stomach) and lots of spaghetti. Faux products can be helpful for people who are transitioning to veganism, but they never held much appeal for me, and they don't seem to entice most food lovers I know. What does appeal to nearly all cooks is fresh, local, seasonal produce, served up in innovative ways. So if you've had a hard time warming up to Tofurkey, fear not. The point of vegan cooking is not to replicate meat, but rather to embrace the extraordinary variety and nutrition of plants. That was my first big misconception about veganism. This was my second: like many people, I thought that vegan cooking was time consuming and difficult. When I flipped through my first vegan cookbook, I was enthralled by the sounds of the food, but I also noticed that most of the recipes called for about twenty ingredients. Between all of the chopping, washing, spinning, shredding, and seasoning of vegetables, how could anyone get dinner on the table in thirty minutes or less? Did any vegans have full time jobs? I assure that, then and now, a lot of vegans have full time jobs (and full time lives). I'm a really busy person -- after years of working as a book editor, I'm now on the road to becoming a doctor. Rare is the day when I find myself playing in the kitchen for a few leisurely hours. I understand better than anyone that fast food should also be good food, and in the weeks to come, I hope to show you all that plant-based food can be simple, fast, and tasty. My favorite moments as a vegan cook happen when I discover a new way to prepare a food I've loved all along. I am one of the ever-growing group of people who are infatuated with raw foods (if you're wondering what those are, rest assured that I'll reveal all you need to know soon) this most often happens when I realize that an ingredient I've only ever eaten in cooked form can be every bit as delicious when it's "un-cooked." Take kale, for example: it was always my favorite leafy green, but until I became vegan I had no idea that raw kale dishes were permissible, let alone delightful. Oh, how wrong I was. Raw kale salad is a game changer, and once you've played, it's hard to see mesclun greens or baby spinach in the same light. 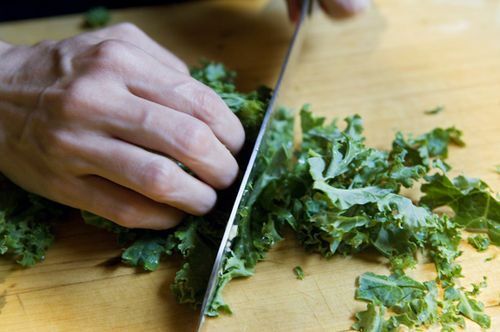 The trick to a fine kale salad is "massaging" your dressing into the kale with your fingertips. This helps to wilt the kale ever so slightly, and if you can get over the hilarity of tenderly rubbing down a vegetable, you'll quickly understand why raw kale salads are all the rage. Kale salad holds up nicely to most all dressings, though the ones with more fat -- from oil, tahini, or avocado -- tend to work best. Save your lighter dressings for more delicate greens. A common challenge for the new vegan convert is to make salad after salad that tastes wonderful, but fails to satisfy. Lentils (and other legumes) can help to keep you full, and they'll also help you to get some of that protein that new vegans tend to fret about. If you'd like, you can add some cooked new potatoes to this salad, or serve it with a hearty slice of grain bread spread with hummus. I'll be sharing many more tips for building "whole" vegan meals -- and salads that serve as meals! -- in future columns. If you're in the early stages of exploring a vegan diet, you'll probably get asked whether all vegans eat is salad. The answer is no, and in the coming weeks, I hope to show you that there's a lot more to veganism than greens alone. But when greens taste this good, it's hard not to wonder what would be wrong with a lifetime of salad, after all. A very ripe avocado, mashed up almost liquified, juice of one lemon, agave nectar, s/p...all this whisked together then tossed and mixed with the salad.....I'm getting weak in the knees just thinking about it! Us vegans need someone like you to show the others that vegan food, especially simply prepared recipes, is delicious! I've got as much inspiration in my vegan gourmet kitchen as anyone else...can't wait for future posts. My dad is looking to transition to a vegan diet - I'm so proud of him. This column will be so helpfull. I have a TON of fresh apricots in my fridge, hoping to use them instead of the preserves for the dressing. Hope it works! excited for the new column! We made this salad on Friday, and it was great. I love the contrast of the soft (Canadian!) 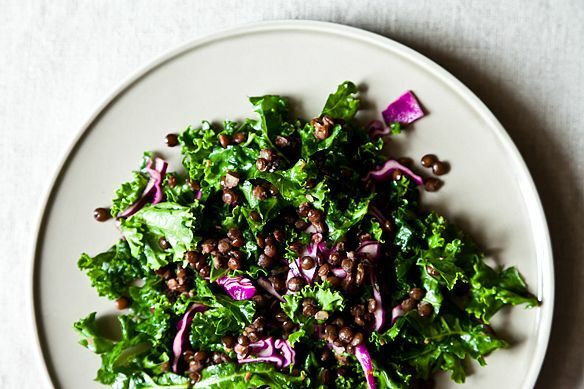 Beluga lentils with the crunchy kale. In subsequent days. the kale doesn't become mushy in the salad, which yields a lot if you serve it as a side dish. Thanks for a great recipe! I am really excited about this column. I am new to veganism and looking forward to the recipe ideas you have to offer. I have many, many vegan cookbooks and some of the recipes have too many ingredients or the bottom line is, the end product sounds so unappealing. My husband "turned" vegetarian overnight about 3 months ago after seeing Fat, Sick and Nearly Dead ... and then almost immediately went vegan. It has been a challenge to keep up with pleasing recipes with some variety so I am incredibly grateful to have happened upon this column! Looking forward to more - thanks! I had totally happened upon this site before but had no idea what was going on over here! Thanks Gena for bringing me back here, this time to stay! This is so much fun. I can't imagine a more perfect recipe to kick off this fabulous new column! Kale and lentils are two of my favorite vegan staples - but the apricot preserves? Such an inspired way to sass it up! Seriously? I'm way jealous. WAAAY jealous!